Both the Archives and the Vancouver Public Library have a copy of this image; the Archives date it to around 1888; the Library think it’s the year before. 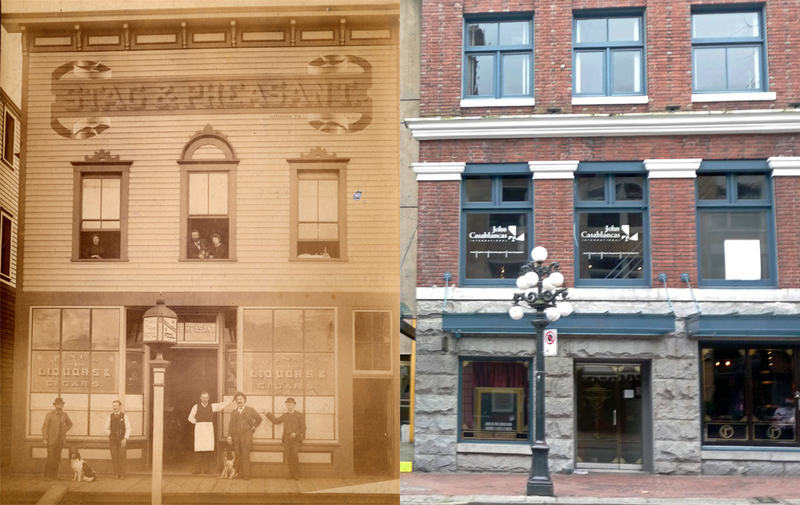 Whichever is correct, this is an early Water Street hotel and saloon built close to Cambie Street and completed a month after the fire. It replaced an earlier saloon in the same location with the same name and was built by Charles Doering and his business partner Bernhardt Wrede. The new hotel had 14 double bedrooms, a dining room, and a bar. There were bagatelle tables and a billiard parlour. George Cary identified two of the figures in front of the hotel; one was him (on the far left), the other his dog, who would chase up the maple tree at the other end of Water Street (before the fire) to retrieve balls of rolled up paper. The saloon was still operating in 1892 because the Texas Lake Ice Co delivered there, and Bernhard Wrede was back as the landlord. Our image shows one of the city father’s more interesting ideas – the light in front of the saloon. The newly elected council of the new city determined in 1886 that every bar should have a light over the door. While this was supposedly to improve safety – at the time the city had a patchwork of wooden sidewalks with some severe drops where the ground had yet to be levelled – a circumstance that didn’t mix well with alcohol – the Woman’s Christian Temperance Union saw it as an opportunity to see – and be seen by – those who insisted on frequenting the saloons. The Stag and Pheasant was the first hostelry to recognise a potential advantage, and added the bar’s name to the light, creating the first illuminated advertisement in the city. Charles Doering (who was actually Carl) sold the Stag and Pheasant to Fairon and Miller in 1888. Fairon was Alphonse Fairon, a Belgian who was in partnership with R G Desautels, from Quebec, and they ran the hotel from 1886 before acquiring it. The Miller was almost certainly Jonathan Miller who had a wide variety of business interests and seems to have had financial partnerships with both Fairon and Desautels at different times. Doering in the meantime had moved on to running the Gambrinus Saloon, two doors east of the Stag and Pheasant, and then later in 1891 the Atlantic Beer Hall on Cordova. These were all sidelines to his main interest, the establishment of a brewery in Mount Pleasant which produced a light lager type beer that became increasingly popular. An 1892 alliance with Danish brewer Otto Mardstrand saw a considerable expansion in the business, which had its own bottling plant, ice plant and a 40 foot water wheel to power the grinding wheel. In 1900 the company merged with the Red Cross Brewery to become Vancouver Breweries, by which point Doering had become a wealthy man. Ben Wrede met with a less fortunate end. Like Doering he was German, starting in Victoria in 1884 and then in Vancouver with the Brunswick Hotel with Doering. 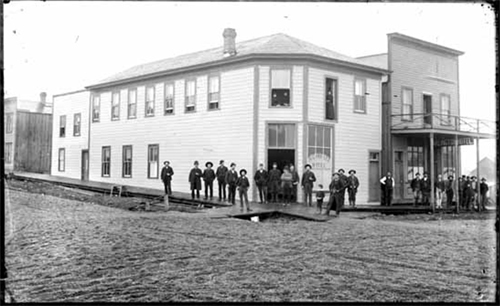 He had an interest in the Fountain Hotel on Cordova as well as the Stag & Pheasant, but in 1896 he caught ‘Klondike Gold Fever’. He moved to Lardeau City, and suffered a series of unstated ‘misfortunes’. Hoping for a change of luck he went prospecting in the ‘scarcely known Omineca country’ 400 miles from his last letter from Bear Lake. Mrs. Wrede was listed as a widow in 1897, his bleached body having been found over a year after he disappeared, having apparently bled to death while cutting firewood. By 1896 it seems to have become the American Hotel. In 1897 it became the Salvation Army’s home ‘The Anchor’ as this 1898 image shows, a role it retained for a number of years. By 1912, the last year it was apparently standing, it was M Aptaker’s second-hand store with the Calgary Rooms upstairs. In 1918 it was added to the substantial brick building that had been built to the immediate west, starting in 1908 and expanded to eventually form a six-storey factory and warehouse for the Leckie Boot and Shoe Co. In 1898 Richard and William Leckie had opened a branch of their family’s Toronto based John Leckie and Company, which sold fishing supplies, oilskin clothing, imported netting, sails, tents, and marine hardware. Noticing demand for boots from fishermen and loggers, the Leckie brothers began investigating the idea of manufacturing their own footwear instead of selling other company’s products. In 1906 they purchased a small shoe factory and a tannery so that they would have complete control of the finished product. In 1908 they hired Dalton and Eveleigh to build a new building which was expanded in 1913 at a cost of $50,000 to include the site of the Stag and Pheasant. Following extensive renovations in 1990, including seismic upgrades, the building now offers office and retail space in Gastown. Here’s Cordova Street – supposedly photographed in 1890, looking west from Carrall Street. Actually it has to be earlier than 1889, because the Dunn-Miller block (the red brick building on the left) was built in 1889. We’ve featured many of the buildings in the picture, but as far as we can tell nothing you can see from around 1888 is still standing today. We featured almost the same view from a 1960s image earlier in the year. The building at the far end of the street looks a bit like it might be the same – but actually it was rebuilt in 1913, and looks quite different. In 1887 Thomas Dunn, the businessman who would partner with Jonathan Miller to build the Dunn-Millar block was already trading here (as this detail shows) – he was said to have been the first to rebuild after the fire. 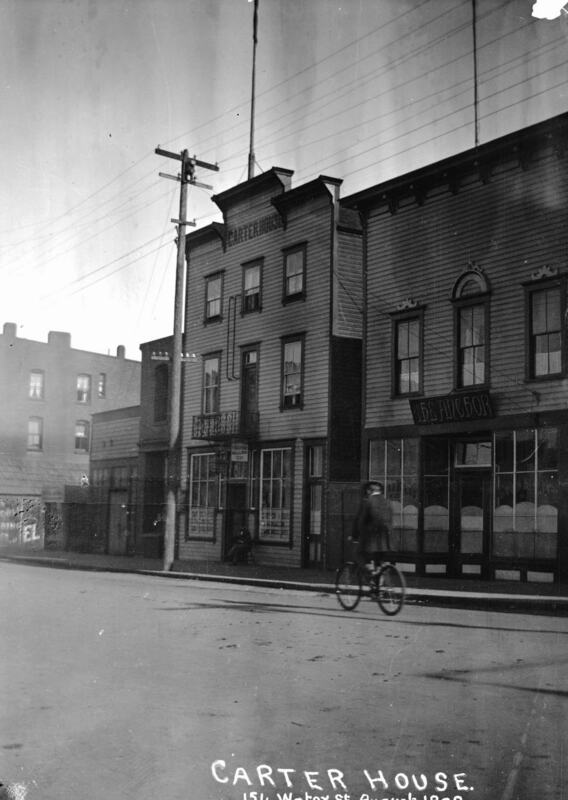 His original store, before the fire, was on Carrall Street. R V Winch had his fruit and vegetable store on the site that Dunn later rebuilt after the fire. Dunn’s company was absorbed later by Wood Vallance & Co, who continued to operate from the Cordova Street premises. Dunn didn’t actually own the site he built on, assuming the interview Mrs Lougheed gave to Major Matthews in 1940. Mrs Lougheed was the daughter of Charles Paull who owned the land, and Dunn paid $100 a month to lease the land on a fifty year lease with Mrs Paull. Once the Lonsdale family bought the whole block in 1912 they paid the Paull family to acquire the lease – $35,000 for the Dunn part of the building. On the right is the Boulder Saloon – built in 1890 on the site of Angus Fraser’s house. That house burned down in the fire, so the present Boulder was actually the third building on the site. 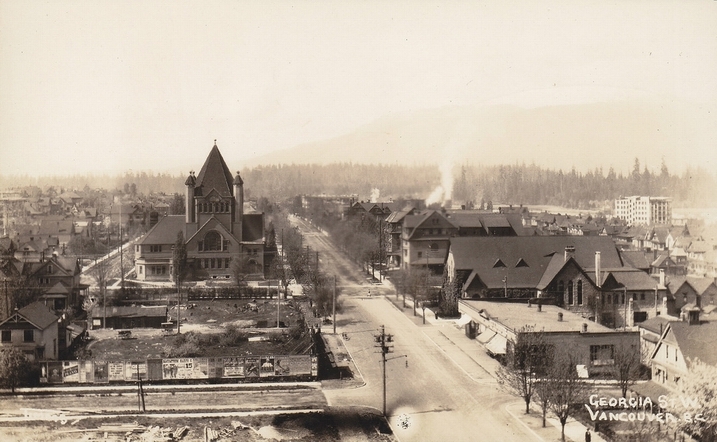 We haven’t been able to identify what the building on the right was: there was no Boulder Saloon until 1890, and the Burrard Hotel (named for owner John Burrard) on the corner of Carrall and Cordova was on the extreme left of the picture – later to be redeveloped as the Rainier Hotel. The 1889 insurance map shows a drug store here; the only druggist with no specific numbered address on Cordova Street was D L McAlpin, so he could be the occupant of the short-lived wooden building. Blake & Muir, solicitors, were at 3 Cordova Street. John Joseph Blake was from Ontario, arriving in Granville in 1885. While it is said he became the city’s first solicitor, he was probably the second. Later he became a magistrate and JP; his 1899 obitiary identified him as the author of the city’s Charter. (Andrew Muir arrived a year earlier, so is more likely to be the city’s first lawyer). Later he moved down the street and to the south side where he was in partnership with his brother, John. Neither brother married, and Andrew left Vancouver in 1891, moving to Nelson, and later Comox. He stayed there 30 years, sometimes working as a bartender at the Lorne Hotel. He died in Vancouver some time after 1940. 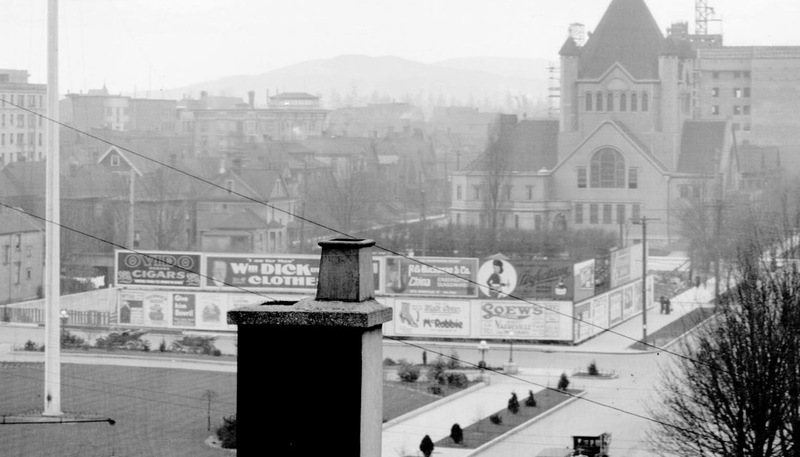 Here’s the site of the third Hotel Vancouver as it appeared some years before it was built – but after it was supposedly going to be built (in 1916). Just behind the photographer’s left shoulder was the new courthouse; today it’s the Vancouver Art Gallery (at least for now). On the next block was the Wesley Methodist Church which stood on the corner of Burrard between 1902 and 1934. Designed by William Blackmore, it ‘borrowed’ its design from a church in Boston. If it looks as if the site for the hotel was vacant, it was. A couple of houses were erected at the northern end of the block, and there were glasshouses built on the corner of Burrard in 1901, but by around 1908 (when this postcard was probably photographed) it was cleared and had a wooden fence around it. It seems to have had a stables on it for a while, but the street directory shows nothing on that block over many years, and the 1922 detail from an aerial shot (below) confirms that. It isn’t surprising that the city finally lost patience with the railway company and forced the issue on the construction of the hotel. Across the street, behind the trees in our 1916 image (and more easily seen in the slightly earlier postcard was (and is) Christ Church – today a Cathedral, but then a parish church for that part of the West End. The church had its own history of partial completion, just like the hotel, but was substantially completed by 1895. Alongside, on the corner of Hornby, were a row of single storey retail units, built (and designed) by A Sharp for S Weaver in 1901. Almost certainly this was Solomon Weaver, a Polish born Jewish businessman who had arrived in Vancouver from Ontario with his wife (who had been born in the US) and children. In 1901 his profession was ‘money broker’, and he had two children at home (although actually there were three). He had first arrived around 1894 and opened a business as pawnbroker and jeweller. In 1911 he was described as a manufacturer, and he was shown (probably inaccurately) as having been born in Russia. There are few details about Mr Weaver’s origins, although he was an important member of the reform Jewish congregation, serving as first president of Temple Emanu-El (who met in the Labour Temple) and a founder of the B’nai Brith Lodge in the city. He established the BC Wire and Nail Company in 1905, and although it burned down within a year, and within two it was closed, and apparently sold off, he remained president and was associated with the firm until 1911. Today the north side of the street is lined with office buildings; the 1986 Hong Kong Bank building is closest to us, the Cathedral Place tower from 1992 is next, and beyond the Cathedral is Royal Place completed in 1973. Between the two images a different set of buildings were built and demolished, including the Georgia Medical-Dental Building, imploded in 1989. Soon the Trump Tower will be visible, off in the distance. Here’s a 1939 image showing the Hotel Vancouver, and the Hotel Vancouver – the second one to the east dressed in bunting for a Royal Visit and the one to the west (on the right) just completed in time for the King and his wife to stay there. When the Canadian Pacific Railway came to Vancouver, they were given valuable tracts of land by the government and city businessmen to persuade them to build the terminal station here. When the Canadian Northern wanted to start services from Montreal and Toronto to Vancouver, it was a different matter. While construction on the line started in British Columbia in the summer of 1910, details of the terminus were still undecided. In February 1913 Mayor Gerry McGeer negotiated to provide the land for the railway to come into town. In exchange the railway would build a 500 bed hotel, a tunnel under Grandview to the Main Street stations, extensive station works and development of the filled False Creek Flats and electrification of the terminals (the Northern Pacific Railway were a party to the agreement as well). Altogether the works were estimated to cost $8,000,000 (The railway company had to fill part of False Creek in – but that wasn’t really an issue as they needed the new land for their operations). However, back when it was first announced it wasn’t going to be without a rival if the CPR had anything to do with it. 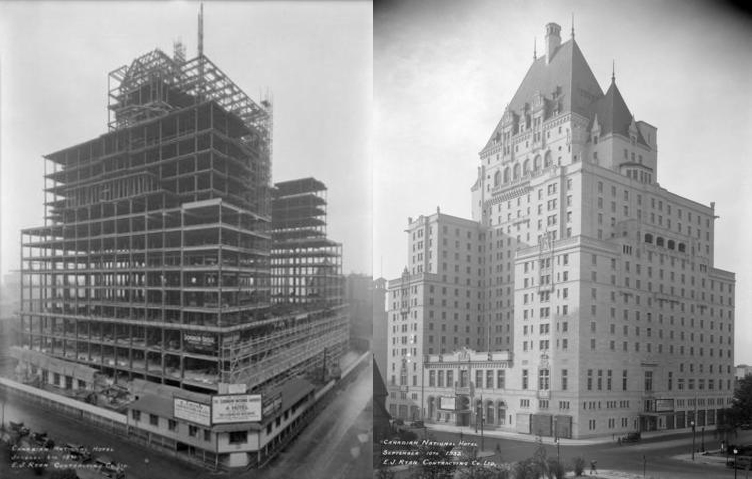 They started construction of the second Hotel Vancouver in 1913, and the final wing was completed it in 1916. That wasn’t the end of their ambitions for the hotel; on October 15 1920 the Contract Record reported further plans for the Hotel Vancouver. “Plans Now Here, Provide for Rebuilding of West Wing and Interior Alterations. At a cost of probably considerably more than one million dollars, extensive changes and an addition are to be made in the near future to the Hotel Vancouver. Besides many important interior alterations, the plans for the enlargement of this big hostelry include the tearing down of the present west wing of the hotel, which is of quite modern construction and was built only about fifteen years ago, and its reconstruction on a much larger scale to conform to the architecture and size of the rest of the big caravansary. It will be remembered that Mr. J. C. Wetmore, a noted New York architect, who designed the famous Biltmore hotel as well as a number of other modern skyscrapers in New York, was here last summer in company with two of the C. P. R. chief architects, and went carefully over the hotel with a view to determining what would be the best means of enlarging the structure to meet the pressing demands of increasing tourist travel, especially during the summer months. That these architects have not been idle in the interim is proven by the fact that very complete plans for the contemplated improvements have now arrived in the city. Coincident ‘with the arrival of these plans comes Mr. F. L. Hutchinson of Montreal, general superintendent of the C. P. R. hotel system, who is to confer with local C. P. R. officials in regard to the best time to start work on the alterations and the rebuilding of the west wing. While not definitely decided yet, it is expressed that an early start will be made on the work and in that case the demolition of the old west wing may he commenced in January and an effort made to have the new wing completed in time for to alignment the accommodations for the midsummer tourist travel. The Hotel Vancouver now contains. a total of nearly 800 rooms, but with the rebuilding of the west wing on a much larger scale, the new plans give the hotel nearly 1,000 rooms, which will mean a large increase in capacity. As far as we know, nothing ever came of these plans. Meanwhile the rival CN grand hotel was on hold as well. The First World War got in the way – and the economy was already slowing considerably up to the war (With the exception of the CPR’s hotel, relatively few large buildings got started between 1913 and 1919). By the end of the war the railway was under the Canadian National banner with federal support as the Canadian Northern had been forced into bankruptcy, and the government had taken over. While pressure was applied to revive the 500 bed project after the war, nothing happened, although in 1925 the Winnipeg Tribune announced “At a conference with Mayor L. D. Taylor, today, Sir Henry Thornton, president of the Canadian National Railways, intimated that it was practically assured that a large hotel would be erected by a local syndicate and operated in connection with the Canadian National Railways. Provision of a hotel was undertaken about 12 years ago by Mackenzie and Mann, the railway builders, as part of the terms by which they secured from the city for railway terminals“. In 1927 the city started court action to get the hotel built, claiming $1,500,000 compensation from the two railway companies (CN and Northern Pacific). Finally CN agreed to build the hotel, and in exchange the city agreed to let the CNR off from building the tunnel and station works – as this 1926 Ottawa Citizen clipping shows the company estimated the uncompleted work would have cost them over eight million dollars. The designs for the new château style hotel (by Montreal-based architects Archibald and Schofield) were approved and the framework finally started in December 1928, the steel frame of the new hotel took several years to complete (as this 1931 image shows on the left). By 1932 the cladding had been applied, but the hotel sat unfinished for several more years, a constant reminder of the depression the economy had entered. In 1938, with the prospect of two huge rival hotels in the city, the City Council agreed to allow the new hotel to be run by a joint CP and CN Board of Directors as the Hotel Vancouver Company, an arrangement that continued through to the 1980s. The news coverage at the time said both hotels faced the prospect of operating deficits, and promised the existing hotel would close, but have a new use – although the Montreal Gazette pointed out that no alternate use was actually identified. The prospect of a Royal Visit by King George VI and Queen Elizabeth to the city finally prompted the completion of the new hotel and it was opened during the royal visit in 1939 having cost $12 million. With the agreement to jointly run the new ‘huge grey stone structure’, CP closed the second hotel. Some suggest that construction of the second hotel might have been of indifferent quality and the building was deteriorating but there’s no evidence of this, at the time it seems to have been purely an economic decision based on demand for hotels in a period when the economy was still shaky and the country was just entering a second period of wartime uncertainty. CP never found an alternative use for the second hotel, and homeless Second World War veterans occupied the vacant hotel building at the end of the war. It was officially turned into a barracks before finally being demolished in 1949. The site sat empty for many years until the construction of the Pacific Centre Mall got going in the early 1970s. Today the Eatons/Sears portion of the mall is getting a total reconstruction around the 1970s frame, while the Hotel Vancouver is also receiving a facelift. The Clarence Hotel first appears in a street directory located on the south west corner of Pender and Seymour Street in 1894, with F Foubert as the owner. The first time we can find Frank Foubert in Vancouver was in 1889 when he was listed as a contractor, clearing land. From 1890 to 1892 he was the proprietor of the Arlington Hotel at 506 Pender, living in the 400 block of Seymour. While this is the 600 block of Pender today, in 1890 it was the 500 block then, with the St Charles Hotel on the corner, run by Miss Annie and Miss Nellie Ryan, and the Arlington was next door. 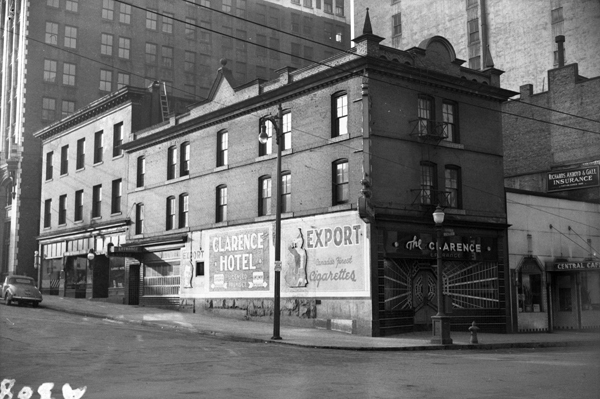 The Clarence was built on the corner, replacing the St Charles. A fire in 1892 had apparently damaged it sufficiently to warrant replacement, although it only ‘demoralized’ the Arlington. It appears that Frank Foubert bought the site of the St Charles and built the Clarence next door to the Arlington. The Marquis of Queensbury, who had owned the St Charles, built a new hotel across Pender on the north side of the street which became known as the Delmonico. From this VPL picture of the hotels before the fire and after the Clarence was built, it seems as if the Arlington was repaired, at least for a while. We don’t know who designed the Clarence, although in 1902 we know William Blackmore and Son worked on a design for a hotel for Frank Foubert – but no location is identified. That could be the addition to the south that was clearly added after 1900, the date of our main image. However, it seems more likely that Frank had already moved on from the Clarence and was moving into a new business – he may not have actually built a hotel at all. In 1901 he was described as the owner of the Stanley Park Brewery, although his census entry was as hotel-keeper. The brewery was located in a house near the entrance to the park; it seems it was started in 1897, and in 1902 Hose and Allen were the proprietors. Today you can read how Frank was a Belgian brewer, whose traditions are kept alive by the latest incarnation of the Stanley Park Brewery (actually located in the industrial part of Annacis Island in Delta). The 1891 census identifies 40-year-old Frank, and his wife Charlotte (who was aged 24, the same as their domestic servant, Isabella Ferguson) as having been born in Ontario. Indeed Frank’s father had also been born in Ontario. Very unusually, while Charlotte was identified as a member of the Church of England, Frank was recorded as having ‘no religion’. They had a baby daughter, Ethel, and a son, William, was born three years later. In the 1901 census Frank has lost a year in age, but Charlotte was only seven years older than a decade earlier so there’s nearly a 20 year gap in their ages. Both Frank and Charlotte are still shown as coming from Ontario, although Frank’s ethnic origin is now identified as French (and so there’s no obvious connection to Belgium at all). In 1902 Frank was shown living at Chilco Street and T G Bligh was proprietor of the Clarence. The Daily Colonist of July 22 1903 reported “Frank Foubert, formerly owner of the Stanley Park Brewery, and lately conducting a liquor store on Pender Street, died this evening, age 50 years.” This would explain the 1903 directory entries for that year that have Frank living at 1544 Barclay Street with a wholesale wine and spirits warehouse at 751 Pender. In 1903 James W Massey had the Clarence, running it for three years. John Hector and his wife Augusta were the hotel keepers between 1906 to 1912.They were from Sweden, although in Canada for a long time (having both arrived in 1874 when they were both aged around 12). In 1911 they had two daughters, Ruth and Jean. Charlotte Foubert continued to live at the Barclay Street address, and the family were still there in the 1911 census. In 1913 William Foubert is the homeowner and working as a clerk with the CPR. In 1912 there were several long-term residents living in the hotel, and the bar must have been quite the venue, with 3 full-time barmen listed. Gerald Spearin was the proprietor, along with Gustus Swanson. Gerald was aged 50, born in Ontario into a family with Irish origins. Justus Swanson was eleven years younger, married with four daughters and a son. He was a Swede who had arrived in Canada with his wife in 1896, although all the children (including Hilma, Runhild and Ringwald) were born in BC. In 1901 he had taken on the licence of the Union Hotel at 223 Abbott street from Peter Larsen. The Hotel changed hands after this on a regular basis. In 1913 Jack Seabold had the hotel, a year later in conjunction with F McElroy. In 1915 it was L Barclay and W McMullen and a year later A Dignes and William C Bennett. There was finally some continuity as Anton Dignas was listed as owner in 1922 . During the mid 1920s the hotel name disappears, and the building is listed as vacant. By 1930 it’s up and running again, with H McArthur in charge. In 1940 D Turcotte was running the rooms, while Mrs R E Low was listed as being in charge of the bar. This was the year that one of Vancouver’s more notable court cases occurred. Mr. Rogers, an African Canadian man, and his white business partner, (they owned a shoeshine stand), entered The Clarence beer parlour after work and ordered a glass of beer. The waiter, as instructed by his employer, refused to serve Mr. Rogers because of his race and colour. Mr. Rogers sued the tavern owner for the humiliation he suffered because of the discrimination. In 1944, as the picture above shows, the Clarence had lost its arched entrances. Over the years it became another Single Room Occupancy Hotel with a bar. It incorporated the two buildings to the west, and more recently has become the Seymour Cambie Hostel, with Malone’s bar on the main floor. Image sources: City of Vancouver Archives LGN 708, CVA 1184-227, Vancouver Public Library. The Lux was a locally designed theatre (although really a movie house) that lasted for over 50 years on East Hastings Street. We looked for a ‘before’ image for a long time before coming across this image from 1994 on Christian Dahlberg’s website devoted to Vancouver’s neon. The Lux was built in 1939 and finally closed in the 1990s after a last-ditch attempt to keep it going by advertising its presence with the dramatic paint job and the offer of a $2.50 double bill. It had briefly taken on a new role in the late 1980s and early 90s as a real theatre – mostly as home to local punk music events. It was a local visual landmark, photographed by both Fred Herzog and Greg Girard. The Lux was originally built by the Odeon chain, designed by Thomas L Kerr who also designed the Odeon on Granville Street (still standing today, much altered and now closed), and had around 900 seats. 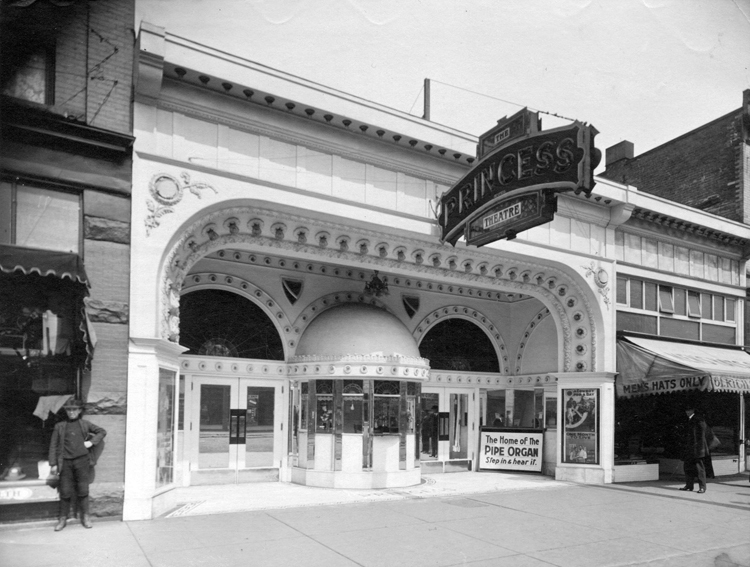 It wasn’t the first theatre on the site – that was the Princess. The Princess appears around 1910 (the first reference to it in the Street Directory). Although it has been attributed to E E Blackmore with Charles Shand (who designed the Empress Theatre across the street) we haven’t been able to confirm that, and have some doubts that they were involved. In 1910 there was a $1,000 alteration permit for the theatre carried out by Irwin, Carver & Co for owner and architect (supposedly) Angelo Calori; the Italian hotelier who had recently built the Hotel Europe. There is a court case in December 1905 with Calori contesting a Mr Andrews’ attempt to renege on a deal to sell him a property on Hastings Street. From what we can tell it is the theatre lots. He was successful in gaining ownership by 1907. There is a clipping from March 1910 with him taking out a permit to build a one storey building at a cost of $8,000 pretty much on the site of the theatre, and then the conversion to the theatre (actually a purpose-built movie theatre) that year. (We’d guess Norman Leech was a more likely architect; he designed something similar on Granville Street around this time). Today there’s a new Lux; one of the more recent non-market housing schemes funded by the Provincial government on land provided by the City of Vancouver. Designed by Gomberoff Bell Lyon and managed by Raincity housing, the Lux provides 92 apartments and was completed in 2009. The site is slightly larger than the cinema, incorporating another building site, but the Lux name lives on in the same location. We already saw this view as a postcard; here it is in a wider view looking all the way to the Flack Block and beyond. The Arcade was still standing at the corner of Cambie Street (in front of the second tram) with the Flack Block beyond on the other side of Cambie. We already identified the building with the curved second floor windows behind the first tram as the Mahon Block in the earlier post. Next door there’s another 2-storey building that we’ve failed to confirm the identity of the builder; we think Thompson Brothers, a stationery company. had it altered in 1913, but we’re not sure who built it originally. To the east, the tall, thin building is still standing today – although in our summer shot the street tree hides it from this angle. It’s the Skinner building, and it was built in 1898, so the second oldest on this block. It’s four storeys with an almost fully glazed facade designed by W T Dalton for Robert B Skinner and Frederick Buscombe for Jas. A Skinner’s wholesale china and glassware business. Beyond that to the east is a rather handsome 1899 building, built for Thomas Hunter and designed by Blackmore and Sons. Today it’s one of the few ‘gap teeth’ in the city – the building was destroyed by fire in 2004. Next door to that is the oldest building on the block, the 1894 and 1898 Rogers Block designed by William Blackmore and Parr and Fee in two almost identical phases. As we noted on another blog, Jonathan Rogers would almost certainly be unhappy with the current use of his buildings. These days they house the offices of the Marijuana Party and the Amsterdam Cafe. In 1916 Jonathan Rogers was the main organiser in Vancouver of the People’s Prohibition Association who successfully lobbied for the introduction of Prohibition in British Columbia (which lasted from 1917 to 1921).